BentoLunch.net - What's for lunch at our house: More Theater Snack Bentos for Faith! More Theater Snack Bentos for Faith! After a weekend of Girl Scout teepee camping, Faith and I are home again. I think the great outdoors conspired to make me sick. But life goes on and the girl has theater again tonight, so a snack must be packed! I opted for a cute three-tiered box I got last year in California. Each compartment isn't very large, but they're completely separated which is great with things like melon. 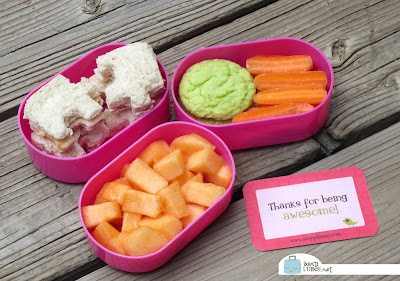 Faith has a ham and cheese sandwich on honey-wheat, cut into puzzle pieces with our Lunch Punch, some cantaloupe, carrot sticks, and two key lime cookies she made herself. They're pretty good too! Also included is one of our new Lunchbox Love notes (pack 51) because she is kind of awesome! Yum.. and key lime cookies?? Do share the recipe!